« *** WINNERS *** Carolena and Lois are Living the Life of Riley! CONGRATULATIONS! I love decorating my house for the holidays as well as having friends and family over for big meals and big laughs! One of the rooms I love to make extra festive is our formal dining room, or as we call it during the holidays: "The Nutcracker Room". On our first wedding anniversary, my husband bought me a complete set of beautiful holiday dishes, which I lovingly set the table with every year. Of course this dinnerware is only used for less than two months per year, so how can I protect it for the other 10 months it's in storage? That's where OrganizeWorld.com comes in! They allowed me to review their Quilted China Storage 6-Piece Starter Set in order to protect my precious holiday dinnerware. Keep reading to find out my thoughts on this product! I reviewed the Quilted China Storage Starter Set from Organize World, which retails for $34.99. I love using quilted china keepers to store my best dishes, used only for special occasions. Once I moved into my first house, my mom and dad gave me the complete set of bone china that my grandmother bought in Germany and had saved especially for me. These are the nicest dishes I will probably ever have and I wanted to make sure that they were protected properly. Since purchasing my first few sets of quilted china keepers, I have been sold on using these to store and protect my valuable dinnerware. 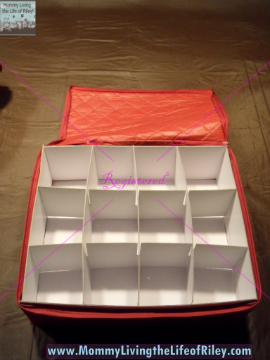 Cup Chest, 13.5" x 11.5" x 4"
Platter Case, 12" x 18"
This storage set is top loading, except for the platter case, for easy access and even includes self-correcting nylon zippers. 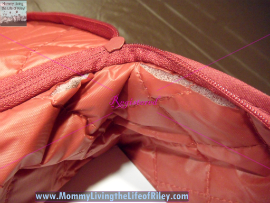 I really liked these zippers for they had a large handle on them and glided very easily along the zipper path. The Quilted China Storage Starter Set also includes dividers for safe storage of your plates, but I wasn't very thrilled with what I saw. These dividers were nothing more than small squares of thin Styrofoam sheets. They weren't very large and you would have to use many of them pieced around in order to adequately protect your dinner plates and possibly even your salad plates. I thought the included dividers were very cheap and not what I expected. In the previous china keepers I have purchased, the dividers were quilted pieces of nylon material cut to the appropriate size of their container. 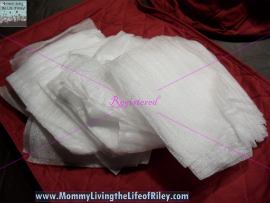 I admit that I was surprised at the "one size fits all" Styrofoam sheeting used here. I also wish that there might have been a china keeper included in this set with which to safely store your bowls. The set of dinnerware I have contains dinner plates, salad plates, dessert plates, and bowls. I do not have the cups and saucers as part of my set and although I can remove some of the chipboard pieces in the cup chest so that I can store my glassware, I cannot fit my bowls inside the saucer plate case. The Quilted China Storage 6-Piece Starter Set is made from soft nylon which is very lightly padded. But, as you can see from the picture above, this nylon material is rather thin and has already split in several places inside the cup chest. I was disappointed in seeing this for it doesn't make me feel very confident that my holiday dishes will be adequately protected. Since these dishes will be stored in a large plastic tub in my garage for 10 months out of the year, I am now afraid that this nylon material will split and crack due to the heat from being outside. Unfortunately, my review of the Quilted China Storage 6-Piece Starter Set from OrganizeWorld.com is a mixed one. 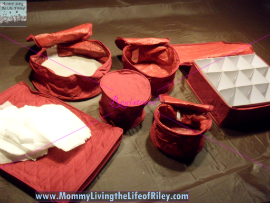 I loved the sturdy nylon zippers and the festive cranberry color of this set. However, I wasn't impressed at how the nylon material had already split in several places inside the cup chest and I really didn't like the small, square Styrofoam sheeting which serves as the dividers between your plates. Of course these same quality issues I had with the china storage set may not occur with another set, and if you don't mind the dividers included, this would still be a good buy. Any tips on ways to store your best china or holiday dinnerware when not in use? Disclosure: I received the Quilted China Storage Starter Set from Organize World in order to facilitate my review. No other compensation was received. This product review is based on my own personal experiences with this item and is completely honest and objective.